There can be several reasons why you have low water pressure in your home. In older houses the most common cause is clogged pipes that have built up residue over the years making it difficult for water to pass through. In this case it is sometimes better to replace the plumbing altogether; especially if the home has the old metal water pipes. Another reason that the water flow in a home is limited could be nothing more than the fact that the main shutoff valves near the water meter are not fully opened. That’s the first thing you should check. 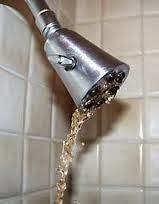 There’s no sense in paying for a service call from your local plumber is this is the only problem. If you have newer plumbing in your home and the valves are turned on fully than it is time to test exactly how much water pressure you have. You can ask your local water department to test if for you or you can purchase a water pressure gauge at the nearest home improvement store and do it yourself. Satisfactory water pressure should be between 45 – 55 psi (pounds per square inch). The easiest way to test it is to simply attach the gauge to an outside spigot and turn on the water. If the pressure outside is low than you know immediately that the plumbing is not the problem; the water coming into your home from your water department is. In some cases your provider can actually boost the pressure for you but many times they cannot. If this is the case then you can solve the problem by installing a water pressure booster system. You can buy one starting around $300 and that’s not a bad price considering how inconvenient low water pressure can be when taking a shower or doing the dishes. You can buy systems at your local home improvement center, plumbing supply stores or online. One word of warning: DO NOT increase your water pressure more than 80 psi. Most plumbing fixtures cannot handle any pressure higher than that and eventually the washers on your plumbing fixtures will wear out and begin leaking. Too much pressure will also place excessive strain on your plumbing and could cause problems. You will find that levels around 45 – 50 psi will be more than sufficient for most people. It is also possible that your municipality may require you to install a reduced pressure and backflow preventer so it’s best to check with them before installing your new booster system.